At Capitol Home Health, we are blessed with an amazing team that enjoys volunteering, donating and giving back as much as we do! We pride ourselves on being active community members in Austin, San Antonio and Marble Falls. Over the years we have been able to participate in countless activities that have allowed us to grow as a team and to help others. Here’s some of the efforts that have touched our hearts the most! Capitol’s owner and CEO, Jerry Shults was able to raise $7,599.00 for the Make-A-Wish Foundation in June of 2017! 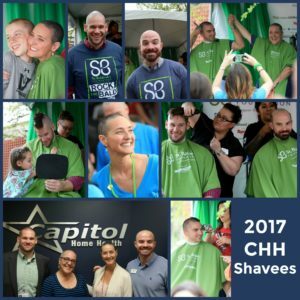 In honor of an employee who lost her son, Pierce, to cancer, Capitol participated in a St.Baldrick’s event where five employees shaved their heads to “Brave the Shave” to help fund childhood cancer research! We were able to raise $16,495.00 in April of 2017! Hurricane Harvey struck Texas in late August and since then Capitol’s employees, friends and family have all come together to donate supplies to those in need. We were honored to be a donation drop-off location and so far have been able to send over four truckloads of donations and are still receiving items from the community! 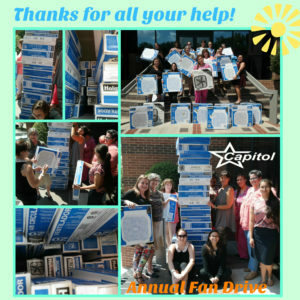 Annually Capitol participates in a Summer Fan Drive that supports the elderly in our community. Capitol matches every fan donated! Talk about double cool!